A hyphen makes a big difference in Valiant’s new Ninja-K series. Colin “Ninjak” King is one of the main superheroes in the Valiant universe, but his upcoming ongoing series reveals that he’s just the latest in a line of ninja spies designated with a letter of the alphabet, starting with Ninja-A back in World War I. Matt Kindt’s previous run on Ninjak was rooted in supernatural kung fu elements, but this new title is committed to spy storytelling and exploring how these ninja agents have functioned in different covert operations over the past century. 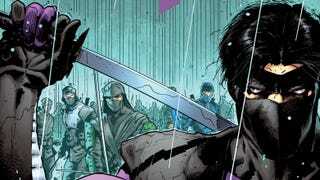 Written by Christos Gage with art by Tomás Giorello and Diego Rodriguez, Ninja-K prioritizes the espionage aspect of this character and concept, and this exclusive preview of November’s Ninja-K #1 kicks off the series by exploring Colin’s predecessors in the role. These pages spotlight the shifting relationship between England and Japan over the course of two World Wars, with Japan providing the first ninja operative (originally called “The Ninja”) in World War I. He eventually trained a successor (Ninja-B), and they would end up fighting against each other in World War II when their countries’ allegiances changed. Giorello and Rodriguez have done gorgeous work on Valiant’s current X-O Manowar series, and their art for Ninja-K holds on to that explosive spectacle while reinterpreting it for a more grounded story that doesn’t involve warring aliens in space. The visuals for these pages are a nonstop stream of action, maintaining a steady flow of dynamic energy as the script delivers necessary exposition. Ninja-K is part of Valiant’s “Icons” line-up of series, which includes the current series X-O Manowar and Secret Weapons and the new Quantum & Woody series debuting in December. These series have Valiant’s top talent working on its biggest characters, and they have higher production values that lend them an extra element of prestige. Readers can learn more about the history of Valiant’s ninja superheroes when Ninja-K #1 goes on sale November 15, but in the meantime, here’s a first look at finished pages from the first issue.